Elvis: The Hard Rock Collection - Misc. Have you ever wondered which Elvis Items belong to which Hard Rock Cafes? A new website application offers you the answer right away - that is, if you have Microsoft Silverlight installed on your computer. 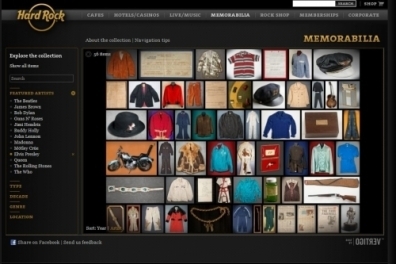 Click the link below to discover where the Elvis artifacts of the Hard Rock chain are located. Enlarge them in mind-boggling detail. Happy Elvis-exploration! To Steve V. Maybe its like in Baseball when Gaylord Perry won his 300th Game, he changed hats every inning, so you can have the hat he wore in his 300th Victory 9 times or more, So in the case of Elvis and all the others how do you know if there was 1 or 101. Its all about Money, but now they pick you dry and call it an auction. Alot of these items dont seem genuine. The Jailhouse Rock jacket; i thought that was going up for auction sometime soon? they cant both be real. The jumpsuit apparently worn in 72 looks like a cheap impersonators suit. As do alot of the other clothes. At first I thought the Hard Rock was a great place to visit and see some great stuff. Then, when they started to pop up everywhere I began to question a lot of the authenticity of some of the items. I could swear Ive seen the same Lennon artifacts in several of them. Have a look thru this. Not sure I've ever seen the very 1st item, & as for item 3 "the "Gold Jacket"....! This is right up there with the unpleasant Dave Hebler selling poor old Frank Skinner a fake Tupelo Fair Show shirt. It's easy to get a "Letter of authentification", it does not mean a thing, nor does buying from a 'reputable' auction house guarantee authenticity.